A Town Centre church which welcomes a 50 plus congregation to worship on a Sunday morning including a creche. We have a range of activities during the week and various types of community involvement as we seek to love and serve Christ together. Everyone is welcome to our Morning Service, which takes place on Sundays at 10:00am. 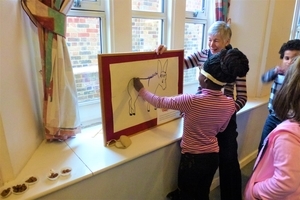 Creche facilities and activities for older children are available on Sunday mornings. Our minister leads worship a few times each month, at least once a month there will be Holy Communion. Otherwise worship will be led by a visiting minister or local (lay) preacher. Occasionally we will have alternative services such as Cafe Church or Church with Choices. Do come along and find out for yourself what this is all about! Our latest Cafe Church will take place on Sunday 17th February at 10:00am. Held in the downstairs hall and led by our minister, Rev Debbie Borda, we had the opportunity to discuss questions around the theme of "Christ the Good Shepherd" over tea and coffee. After worship we meet for refreshments and fellowship in the hall downstairs. The next Church with Choices will take place on 19th May. Evening Service: Reflective Service at 6:00pm last Sunday of the month. There will be a short service on the first Wednesday of every month in the Coffee Lounge, which will include the act of Holy Communion. Please do join us as we share in this special time. 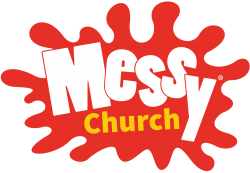 Messy Church - A way of being Church for families involving fun. Found across the world (ours has a link with a Messy Church in Port Stanley in the Falklands), values are Christ-centred, for all ages and based on creativity, hospitality and celebration. Second Sunday of the month at 4:00pm with a break for Summer in August. All children are welcome, accompanied by an adult. 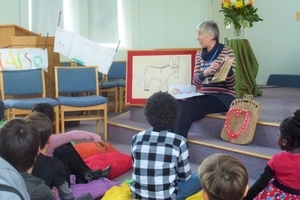 Our latest Messy Church was on Sunday 14th April. 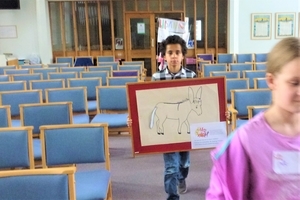 To mark the beginning of Holy Week with Palm Sunday, we focussed on the Triumphal Entry into Jerusalem with Jesus riding on a donkey. We made banners to proclaim Hosanna! to the King of Kings and palm branches and played the favourite party game Pin The Tail On The Donkey. Then we processed into church with our banners and palm branches! Next month we celebrate our 100th session on Sunday 12th May, 4:00pm - 6:00pm! 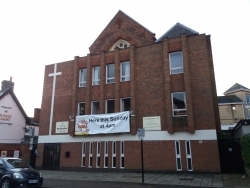 Trinity Methodist Church is a member of Churches Together in St Edmundsbury and District. We believe in being united in Spirit and Truth, by worshipping and serving our Lord God and Saviour together! We want to love others as we have been loved, to reach, affect and support the communities that we are in. House Groups meet for Bible Study and prayer with lively, interesting and often thought-provoking discussions in various homes around the town. We now have four groups which meet on a regular basis the 2nd and 4th week of every month with a break for August - on Monday mornings at Eastgate House, led by Josie Keys and David Wakeford at 10:30pm, on Tuesday evenings at different members' homes from 7:30pm led by Supernumerary Minister Rev Vaughan Tong, plus two Thursday groups. The Thursday morning group meets at 10:45am at Trinity, whilst the Thursday evening group meets at different members' homes at 7:30pm. Our Thursday groups are led by either Rev Vaughan Tong or Rev Val Spencer. We are studying the 2019 York Course, which we hope will help us in our thinking as a Church in what is becoming an increasingly exciting time of opportunity. The theme is "Daring to see God now". 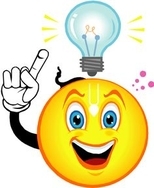 Many organisations and groups use our premises during the week - Bury Drop-in Centre, Bury St Edmunds Amateur Operatics and Dramatics Society, Fair Ladies of Bury (Ladies' Morris Dancers), Alcoholics Anonymous, Narcotics Anonymous, Tai Chi, Exercise Classes. Rooms are available for hire, suitable for societies, business meetings, etc. 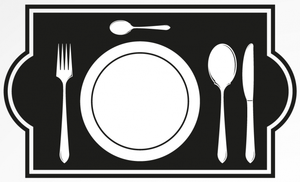 Our Catering Team can provide meals for groups at Trinity of up to 50 in our hall, or 20 in the lounge. TOCT can cater for all manner of special events (e.g. weddings, birthdays) at Trinity or, if you prefer, at a local venue of your choice. You are most welcome to visit us to check out the location and facilities.